Description: It’s a simple counter module. In the example, we have used 4026B and common cathode seven segment display. In place of 4026B, you can also use 7490 and 7447. In the following example, we have connected an astable multivibrator to the counter module. The circuit works as an up counter and counts from 0 to 9. Connect Pin 3 of 555 timer to Pin 1 of 4026B. Project 2: Up counter using multivibrator and counter module. wanna ask, how many code of the resistor and capacitor in project 1 ? 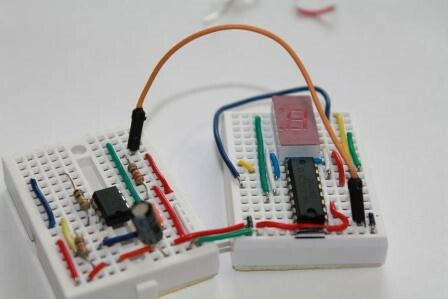 Why is the project made on breadboard is not matching one made in FRITZING??? 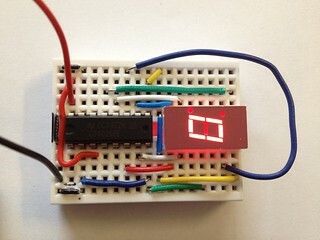 here is the project you are looking for: http://www.buildcircuit.com/object-counter/ thanks for your comment. 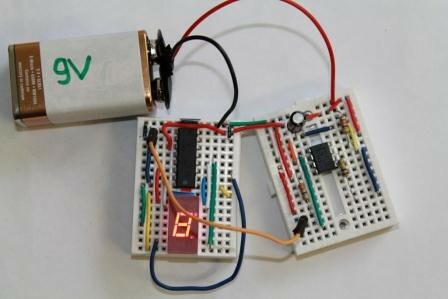 i hav made this circuit and its working! But i want to modify it to a two digit counter what should i do? dear i am going to make this product please show us schemtaic diagram of all part. wat’s the ic name of the display u’ve used?